Diamond mist 0MG is desigend for those who want to enjoy the flavour but with zero nicotine. E-Liquids are used to fill the E-CIGARETTE which allows you to choose from a hugh choice of favours.These E-Liquids can be completely nicotine free. 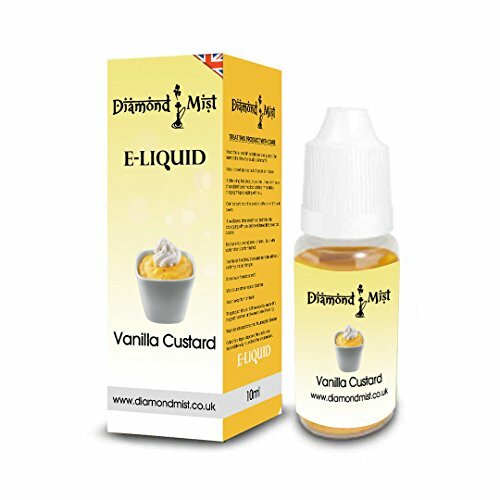 The E-CIGARETTE requires E-Liquid to produce the inhaled vapour which is a simple solution Dimond-mist 0MG E-Liquids contains the following : FLAVOURING: Flavour is added to create a satisfying aroma. PROPYLENE GLYCOL (PG): Dilutes the flavour and produces a smoke like vapour. VEGETABLE GLYCERINE (VG): Viscous and sweet,also produces a smoke like vapour but with a reduced throat hit. A soft, sweet and creamy Vanilla Custard! A trading name of Enchantedchilli Ltd.